On February 24, 2019, we hosted our 3rd spa day for women-identifying survivors of domestic abuse and those experiencing homelessness. Unique for an event geared toward this community - there were no homelessness or domestic violence resources. There were no services that would give recipients cause to self-identify as homeless, survivor, or “at risk”. This event was simply a spa day geared toward helping women feel their best. Five years ago, I moved to San Francisco to work in a Crisis Center. What I didn’t know at the time was that the greatest crisis I would encounter would not be in that work, but rather in my encounters on the streets of San Francisco where thousands of people were going to sleep every night. The hygiene kits are handed to the patient or family upon leaving the clinic. A few staples are soap and menstrual supplies. Soap, for instance, operates in several forms for a family in Haiti and is typically used for bathing and laundry instead of solely for handwashing. Furthermore, particularly in rural areas, access to menstrual management products remain tough to reach and are often neglected. Without a way to access these products, millions of girls and women are prevented from going to school or work. Meet Hannah Regan, Simply the Basics’ summer intern! Constellations was the first gala hosted by Simply the Basics, and joined with Project Homeless Connect, to celebrate the impact made through compassion, collaboration, and innovation. The propositions on San Francisco’s ballots can be confusing. There are a lot of misleading ads, sometimes it can be challenging to know the long term impact, and while many people in the community want to vote properly to support our neighbors experiencing homelessness - it can be challenging to know how to do so. Emily Cohen has dedicated her life to changing the way homelessness is addressed in American cities. 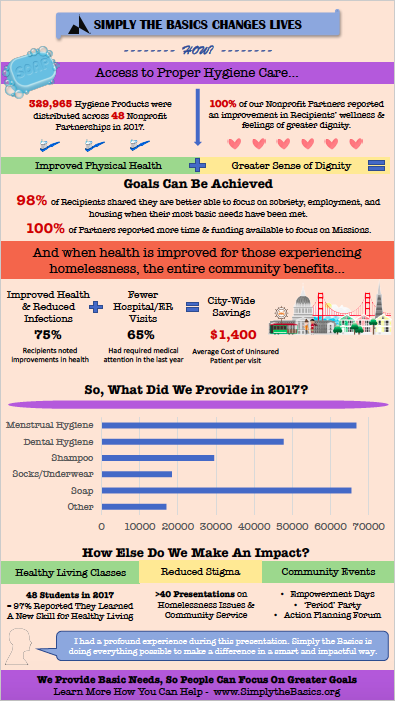 She has generously shared a guest-blog post with Simply the Basics to provide information on Proposition D for the June 5th ballot so that you can be better informed to vote in favor of our neighbors in need. Oral health has a profound impact on feelings of dignity and is integral to Simply the Basics’ programs. Helping our neighbors feel dignified, in addition to addressing the long list of physical health concerns related to dental and oral health, are why we distribute thousands of new and unused dental hygiene products every month. Partnered with Project Homeless Connect, we ensure access to dentures and dentists as well. Learn more here! "Thank you so much for giving me this chance to feel and look beautiful. I struggle with self care due to being a full time student and single mother, today made me feel empowered." In response to the recent hurricanes in Texas and Florida, and to the devastating fires across Northern California, Simply the Basics has once again cleared out our emergency disaster relief storage unit. Thanks to Reddit support, Simply the Basics can now provide over 5,000 additional completed hygiene kits to people in need! For the next few months, we will be featuring our Partner Organization's wonderful programs! Get to know two of our Partners, Downtown Streets Team and A Woman's Place. For the next few months, we will be featuring our Partner Organization's wonderful programs! Get to know two of our Partners, Bay Area Community Services and Compass Family Services. Alexandra Jang-Chin is a student at USF and volunteer with Simply the Basics. She is this week's guest blogger - read her story here! Meet the newest member of the Simply the Basics' team, Ella Rubin! "We’re asking ourselves a more difficult question. In addition to our outcomes, what’s our impact? What’s the lasting change that’s happening as a result of our work? What’s the meaningful difference that we’re making to people’s lives?" Guest Blogger & Data Analyst, Priya Kothari. "On the way to the call center, all walkers would come across this office in which a young blond woman sat. She always had her eyes on her paperwork and she had perfect posture. I didn't know what she did. Since she didn't work with the volunteers, our paths never crossed." Women's Action Planning Forum - Success! Hosted on International Women's Day, Simply the Basics & Givdo coordinated a Women's Action Planning Forum as a way to engage the community in coming up with strategies and actions to directly support women and families and fight for equality for all people. The Women's Empowerment Day was a spa day for survivors of domestic abuse and women experiencing homelessness. The day included facials, makeovers, hairstyling, massages, head-shots, clothing closet, food, online profile set up, bra fittings, and more! We believe in Dignity, Wellness, and Empowerment to lift women! Meet our newest team member, Program Assistant, Phylicia Hisel!